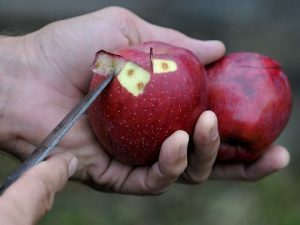 BMSB injury to apple. Photo.Spencer Ainsley Poughkeepsie Jounal file. The Asian invasive brown marmorated stink bug, H. halys (BMSB) was first discovered residing near Allentown, Pennsylvania from specimens collected in the mid-1990s. Today the insect has spread and resides in 48 states and 4 Canadian provinces. It has been found to feed or reside on 300 plant species, causing economic injury in commercial agricultural systems, ornamental plantings and homeowner gardens while overwintering in homes to become a familiar household nuisance pest. The green stink bug, (GSB) Chinavia halaris (Say), is a commonly encountered pest of tree fruit in both the nymph and adult stages across the Hudson Valley and northeast. This species is highly polyphagous (has many host plants) which it damages through feeding and capable of long distance flight to host plants. Both BMSB and GSB are arboreal, dwelling on forest trees along the orchard edge, moving to and from tree fruit to forest trees. Periods of drought often gives rise to these two pests along the orchard edge with greatest levels of damage occurring within the first 90′ perimeter of orchard / forest interface. 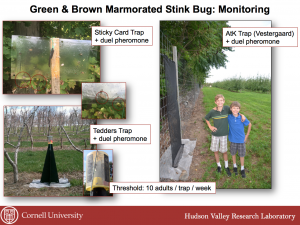 Over the past seven seasons we have been testing the use of various methods to monitor and trap brown marmorated stink bug in Hudson Valley orchards and vegetable crops. This began with the use of black light traps, transitioning to the use of semiochemicals used in Tedders traps, sticky traps and most recently netted attract and kill stations. The science behind developing these chemicals was conducted in a collaboration with colleagues at the USDA’s Agricultural Research Service (USDA-ARS), together with several partnering scientists. 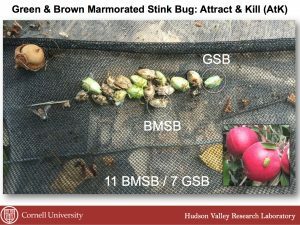 We have focused on the use of these new attractants in “Attract and Kill” stations as a way to easily monitor presence, abundance, and seasonal activity of nymph and adult BMSB and GSB. Both species and mobile life stages are attracted to the duel aggregation pheromone and pheromone synergist lure, methyl (2E,4E,6Z)-decatrienoate (MDT). More recently, the use of ethyl (2E,4E,6Z)-decatrienoate (EDT), has been found to increase the capture of adult and nymph of BMSB when combined with the aggregation pheromone. In our trials, 8′ x 3′ reams of netting are placed on deer fencing along the perimeter of the orchard. Placing the pheromone onto top edge of the netting which is treated or incorporated with an effective insecticide and placing a strip of netting at the base of the trap, allows a farm manager or scout clear viewing of the number of insects drawn and killed on the base of each station. Our early trials employed sprayed Bifenthrin with the use of ZeroFly® Screen by Vestergaard, with Deltamethrin incorporated into the netting for 2017. The ZeroFly® Screen has UV protection to provide durability with the insecticide deltamethrin, incorporated into the fabric, found to provide long-lasting knock-down and mortality of the stink bug complex. The insecticide is continuously refreshed at the surface of the yarns to provided long insecticidal activity (> 1-2 years). The “attract and kill” method attracts individuals of a pest species to a single yet general location, with insects often moving onto the net or simply being ‘arrested’ to the pheromone / synergist general vicinity. 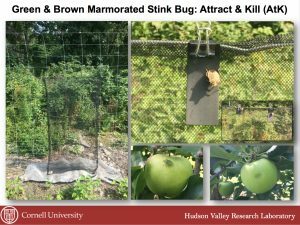 Employing the net as a monitoring tool reduces the time needed to maintain traps, potentially reducing the amount of insecticide applied to crops as populations of stink bug are arrested on the trap and killed along the perimeter of the orchard as they fly to fruit trees from the forest edge. We have not seen reductions of pollinators, or more specifically honeybee using this method. However, the tree dwelling ‘Asian multicolored ladybird beetle’ of the family Coccinellidae, an important predator of aphids and scale insects, have been observed in these traps in relatively high numbers and does appear to have some impact on this beneficial species. Activity of ethyl (2E,4E,6Z)-decatrienoate (EDT) as a synergist with BMSB aggregation pheromone has been published in December in the Journal of Economic Entomology.